It's no fun waking up with crunched eyelashes and pores full of makeup. I know I'm not the only one who has gone to bed with my makeup on—too tired (and lazy) to take a minute to wash it off. This year, I promised myself that I would stick to a nightly routine and wash my face and moisturize each night before I go to bed. What I didn't realize about this routine was how awesome it would make my skin look and feel! Want more details? 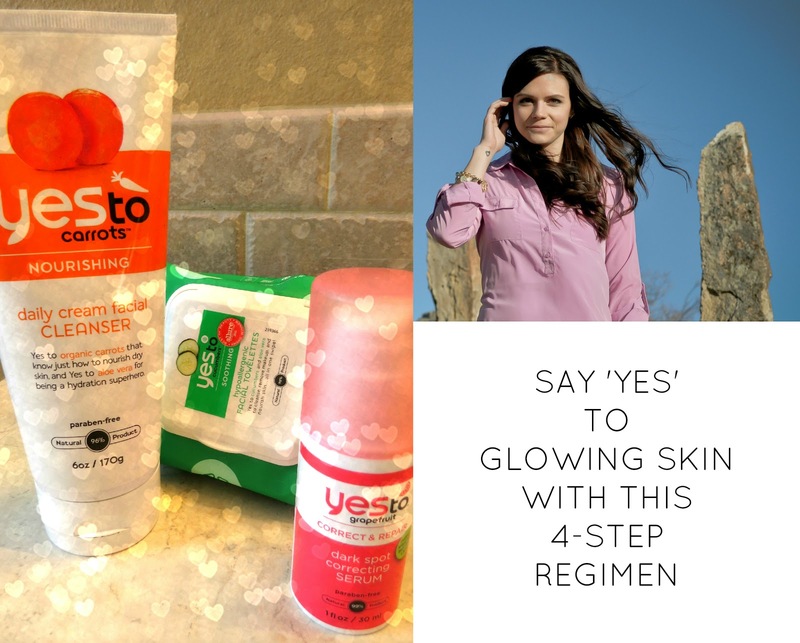 Click HERE to read my newest Yes To Stylista post—my 4-step nightly regimen for glowing skin! Those face wipes are my FAV! I love them! I've heard great things about this product, I must try! Ohhh yes! Skincare is SO important. I am a huge fan (and consultant) of Arbonne, and my teammate likes to tell people "imagine running your finger on your car at the end of the day. That's what you leave on your skin if you don't wash at night." That should be enough to convince anyone! I am obsessed with those Cucumber Face Wipes...I've been using them for years and absolutely love them! Your skin DOES look amazing. I'm starting to get so freaked by all the chemicals in most of the products, I'm finally convinced it's time to make the change. It seems from the comments below, I better try those cucumber face wipes. Thanks for sharing Aunie!!! I too love the face wipes and their moisturizer! Growing up I always fell asleep in make-up and yet had perfect skin without even trying. Then came college and stress and BAM I had bad skin. However that didn't make me change my ways, it just made me wash my face in the morning when I remembered. I started washing my face every night [ I only rinse it in the morning with water and put on moisturizer ] about 3 years ago and it has made a world of difference as does using products that do not contain harsh chemicals. Love this post! I always forget to wash my face at night. Like, always. It's a bad habit. I need to start making a reminder for me to wash it too! And I need to purchase this stuff too! I had some cucumber face wipes from this brand. Smelled awesome too! Target right?? I am literally THAT dumb... for one... the cucumber wipes are in the photo... and two.. I said 'too' waaaaaaaaaay too much. HA! I saw Yes to at walgreens a few weeks back home where everything is more expensive and wanted to cry cause I couldn't afford the little travel packs. I have such acne prone skin I ALWAYS make sure to wash my makeup off. I need to try this stuff! I love all of the Yes To products and even use the makeup remover wipes to spot clean my makeup brushes. I love all the Yes to products as well! I have extremely sensitive skin, so these take good care of it! I ordered some of the Yes to Grapefruit because of your post! I've been trying to find something for dark spots for a while that was reasonably priced. I'm just waiting for it to show up in my mailbox this week! Checking it out now, I need something to make my face clear, any suggestions on products? Far-reaching Industrial coupon codes are codes that you can interest to gross discounts upon your shopping at pandemic industrial online or not. Coupon codes released by the proprietorship serve as touch on of the company their trusty customers. The Yes To Grapefruit line is wonderful! They have exfoliating face scrubs, dark spot removing creams... I love it!